If you've decided that much of your diet is now going to be vegetable based and you have a garden, you might even think about growing your own veggies. There's no doubt that there's something incredibly satisfying about seeing your own plants grow, flower and fruit, and there's nothing like the taste of a fresh picked tomato, courgette or cucumber straight from the garden to the table. However, even gardening is not without its stumbling blocks if you would prefer an animal free lifestyle. Many of the everyday additives many people use to support their plants, contain animal products - even the ones labelled organic. For some people, even animal manure is unacceptable, because it comes from animals that are destined for slaughter. This handy guide to animal product free gardening will help you steer a path through the minefield of gardening without animal products, so you'll soon have your own healthy, thriving and animal free vegetable patch. Plants grow stronger and more abundantly if the soil is treated with a fertiliser. Fertilisers come in many different forms, one of the most common simply being the use of compost. Compost is a rich soil ideal for many plants and full of the nutrients that will encourage strong growth. Most eco friendly gardeners will try to avoid peat based compost because Britain's peat bogs are disappearing fast. It's easy to buy peat free alternatives. One alternative is made from composted coconut coir (the hairy outer on the shell), which is a renewable source of compost and has been shown to work well. Other fertilisers are used to add nitrogen and other nutrients to the soil, which plants love. Unfortunately they are often made from dried fishmeal or bonemeal, which are animal by-products. If you feel you need to use manure type fertilisers in your gardening, look for those which have the Soil Association mark on them. These manures, for instance from chicken droppings, are guaranteed to come from free-range farms. Alternatively, you could contact your local stables and see if you can collect manure from them - it may even be free! Another possibility is fertiliser made from seaweed, which is also a renewable source. Make sure it is not calcified seaweed, which is actually coral and therefore not ecologically sound.The best solution is to make your own compost. A simple bin with a lid can be used to collect all your left over vegetable waste and grass cuttings. Put a spade of earth in to provide the natural organisms that will break down the vegetation and then add salad remains or other vegetable leftovers, grass cuttings, weeds, leaves and any other vegetation. Over the course of the year the matter will break down and can be removed from the bottom of the bin to dig into the garden, as you add more vegetable matter on top. It's a natural, continuing process and guaranteed vegetarian in your gardening as you know exactly what's gone in to make it. If you're not concerned about your vegetable gardening being strictly organic, you could use inorganic fertilisers which are chemical based and do not come from animals, nor are tested on animals. Potash for example is potassium that comes from salts left behind when ancient seas dried up. Phosphate rock, ammonium sulphate and ammonium nitrate are also animal free chemicals that add nitrogen to your garden soil. With the ammonium chemicals you should be careful of their use where animals are likely to encounter them - read the instructions and don't allow animals to feed where you've used them. 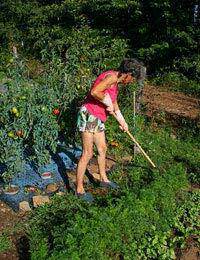 The bane of any gardener's life is the pests that plague their vegetables. Nothing is more disheartening than finding your plants decimated by slugs and snails or a fly infestation. Of course, if you want to be kind to animals, strictly this means you can't kill the pests that trouble you, or use chemicals or other treatments that will harm them. However, there are some natural checks you can apply to help keep pests at bay. Encouraging wildlife to your garden is a great way to keep potential pests down. Frogs and toads, foxes and hedgehogs will all eat slugs and snails, as will birds like thrushes. Build a pond or provide sheltered areas that will encourage wildlife to come in. Often the best defence against slugs and snails is a torch! Go out at in the garden night and pick them off your plants and move them somewhere away from the vegetables. Many insects feed on greenfly aphids, including ladybirds, lacewings and hoverflies. Dragonflies also prey on other insects. Alternatively you can wash fly infestations off with a hose, and pick caterpillars off by hand. Another way to keep pests at bay is to use barriers. Slugs and snails dislike dry crumbly textures and dry sand and gravel may help keep them away from your veg. Or, cut the bottoms off plastic bottles and place them in the ground around your plant stem to keep slugs at bay. These simple tips will keep your garden healthy, thriving and animal free.